Railpictures.ca - A.W.Mooney Photo: Its the dead of winter, a bone chilling cold January afternoon and although the sun is up there, it leaves no impact except to exaggerate the fact it ain’t gonna warm up. And with no trains in sight and the scanner quiet, I elected to shoot the scene more as proof I had been there that day than anything else. Not long after though, the station was bulldozed, the connection to the cement plant (behind me) was taken up and this ends up being a shot for posterity. 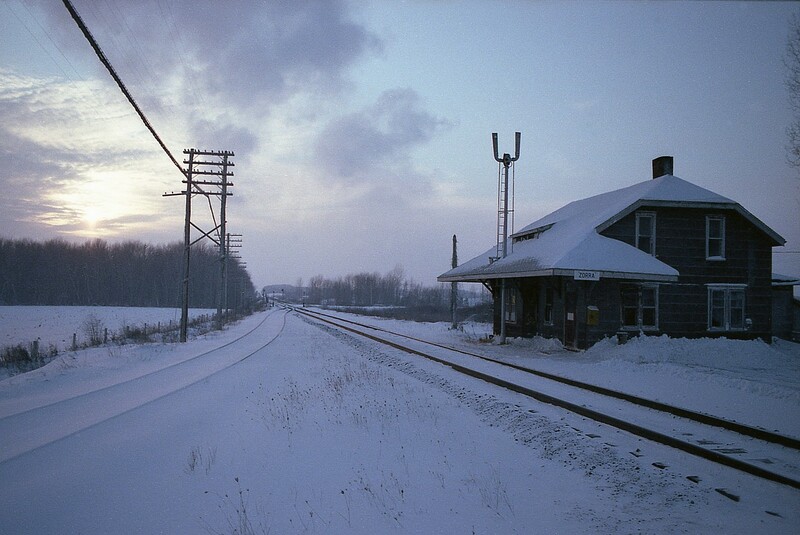 Br-r-r-r-r………….. | Railpictures.ca – Canadian Railway Photography – photographie ferroviaire Canadienne. Ooooh I see – that’r right! So this is facing west and the St. Marys switch in far distance is the one still there. Excellent. The track on the left (which used to go thru to Ingersoll) has been pulled up but the spur (former St. Marys sub) track northward is in the same location it always was, as far as I know. Interesting, so did they move the spur switch back a bit? The switch is installed now and the St. Marys sub is still there for about half a mile for the Cement Plant..
A wonderfully moody image Arnold – I love the blue hues… nicely done, Sir!